In recent years, first-person narrative adventure games have become the genre of choice for independent game developers looking to tell unconventional stories in the medium. With minimal interactivity and the ability to tell a story primarily through writing and design choices, it’s a style that understandably lends itself well to small teams. 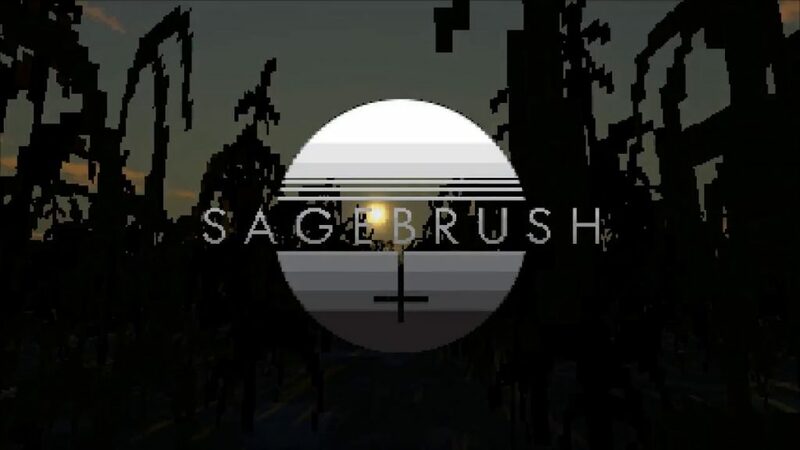 Sagebrush, a new first-person narrative adventure game from Redact Games, takes full advantage of this niche genre, crafting a compelling, heartfelt story about finding a place in this troubled world. Sagebrush puts the players in the shoes of a nameless protagonist exploring a desolate cult compound in the New Mexico desert. Years after a mass suicide, players must find a way onto the compound and explore, piecing together what went wrong through various audiotapes and found notes along the way. As a true crime fan, the framing device alone had me hooked. Exploring an abandoned cult compound reminiscent of those inhabited by real-world cults like The Branch Davidians and The People’s Temple is a unique spin on the narrative adventure game that I hadn’t seen before. 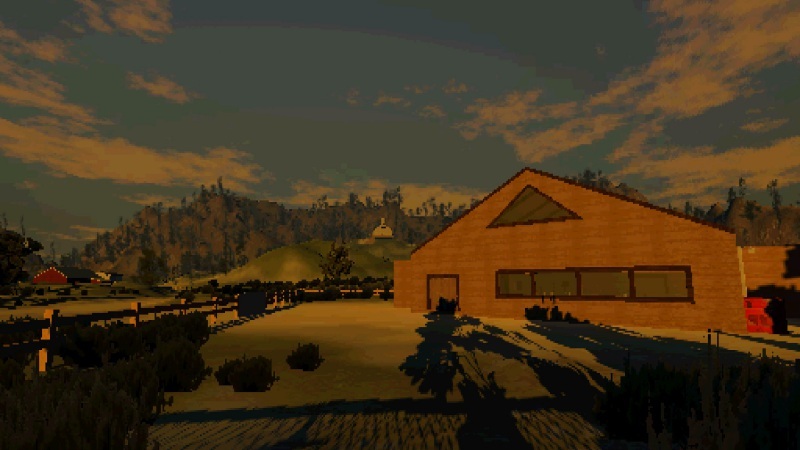 Like Gone Home before it, Sagebrush relies on exploration to progress the story. But unlike Gone Home, Sagebrush gives players a much larger area to explore, with a series of notes and keys to gently guide them. Equipped only with a simple map, players are left to rely on well-placed landmarks and their wits to uncover the truth. Even in Sagebrush‘s low-poly style, the compound is incredibly detailed. Each interior features plenty of unique decoration that adds to the palpable atmosphere, from half-eaten meals to dark secrets tucked under beds. 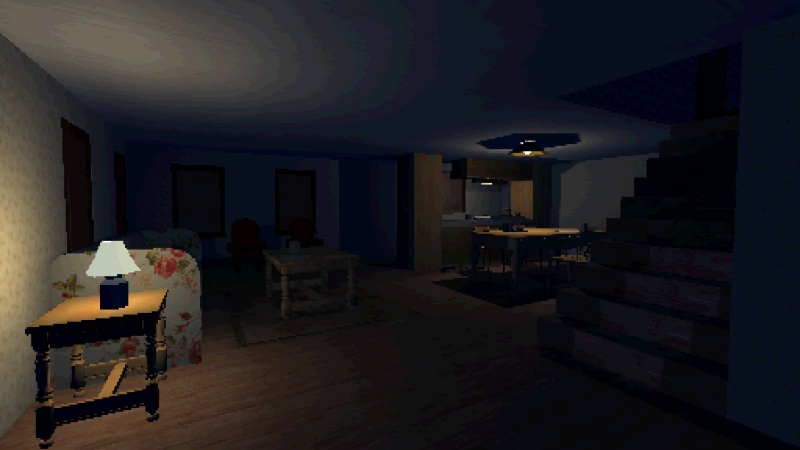 Rooms and interiors beg to be explored as fully as possible, with flavor text adorning almost everything in the environment in the spirit of PS1-era Resident Evil or Silent Hill. Evoking the sensation of wandering through a condemned building, Sagebrush‘s voyeurism invites the curious and rewards them with discovery. I’ve always found the mentality surrounding cults to be fascinating, yet it’s rarely explored in video games with any amount of nuance. 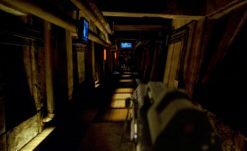 Iconic horror series Silent Hill and Outlast have both dabbled in villainous religious cults, but their antagonists peddle in cartoonish zealotry. 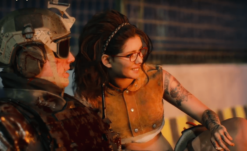 Far Cry 5 similarly failed to give any depth to its villains, opting instead for cliches of vague religious ravings that neatly sidestepped any need for actual exploration of the psychology of cults. Sagebrush manages to eschew these regularly accepted depictions of cults by digging a little deeper. 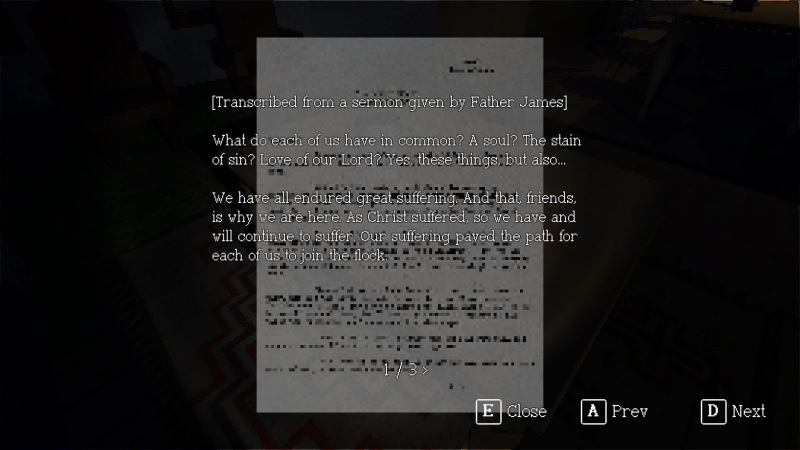 Through notes and environmental storytelling, the player themselves are forced to examine the mentalities of individual cult members, including the roles they played in the cult’s downfall. Though there are no NPCs to interact with, Sagebrush‘s solid writing and tight pacing manage to bring an entire cast of characters to life. Every abandoned trailer, secret letter, and tape recorder serve to remind the player of the lives and relationships that once existed in the compound, how they intersected, and what they left behind. Sagebrush is a ghost story in the truest sense. Sagebrush‘s greatest asset is its refusal to offer easy answers to why or how people would become part of a doomsday cult in the middle of the New Mexico desert. As the truth becomes clearer and the sun begins to set over the arid New Mexico skyline, the horrors of the Black Sage Ranch begin to pale in comparison to the human cost of it all. Players aren’t asked to contemplate the evil of one singular cult leader who leads innocent people to their deaths but instead beckoned to look at the troubled people who took part in his madness. In exploring their lives, Sagebrush invites introspection. What makes someone believe in God? What could drive people to devote their lives to one person? Do they seek validation through God’s forgiveness? If they doubt what they’ve done, can they forgive themselves? In any game, these questions would be easy to bring up, left on the player’s plate like fat to chew and mull over without an answer. Yet, in a masterful stroke of balancing gameplay with narrative, Sagebrush asks these questions and then asks the player to investigate further. The answers are yours to find, even if you might not like them in the end. Though many have tried, few games have managed to explore the mentality of fanatical religion as well as Sagebrush. The game’s minimalist, retro aesthetic, fantastic soundtrack, and tight narrative pacing deserve credit as well, but Sagebrush‘s true strength lies in its humanity. Sagebrush is at once bold, dark, horrifying, and hopeful; its the kind unforgettable story we need more in video games. A Steam review code was provided by the developer.